Thanks to an LCD screen located on a handle you will always be aware of the pressure parameters. Powerful water-cooled motor guarantees long service life of the appliance. A new high-pressure hose is a bit rigid so coiling it to put away is a bit difficult. 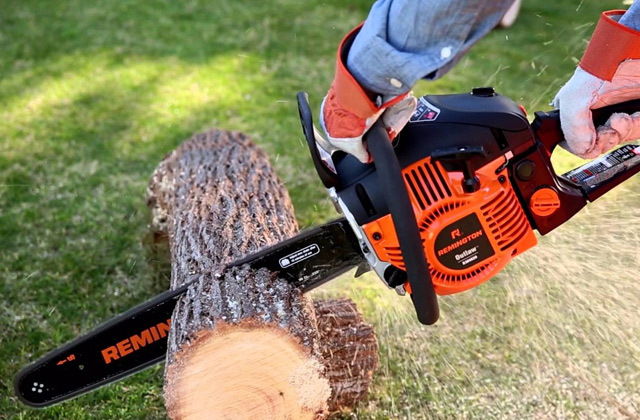 This powerful and effective machine is incredibly handy and reliable. It will help you achieve the best clean environment and will reduce the cleaning time drastically. The washer is pretty compact, so it won't take much space in your garage or storeroom. The 90° nozzle allows washing in tough places. It feeds less water than most models, so you'll have to spend more time cleaning. 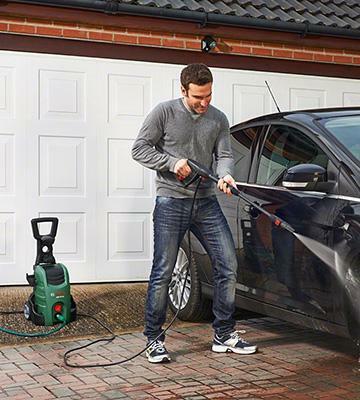 Bosch pressure washer guarantees 100% quality and robust performance. 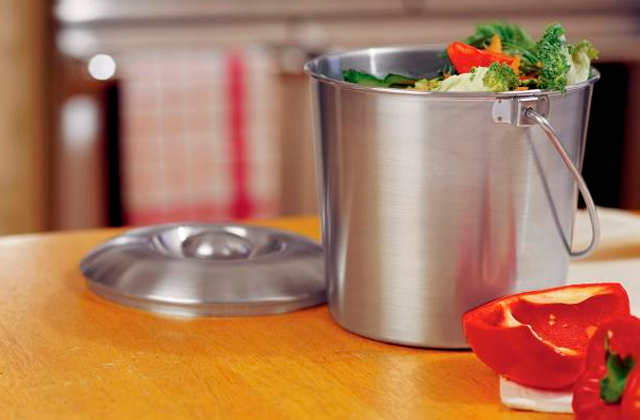 The combination of functionality and compact size ensures hassle-free operation on big and small surfaces. 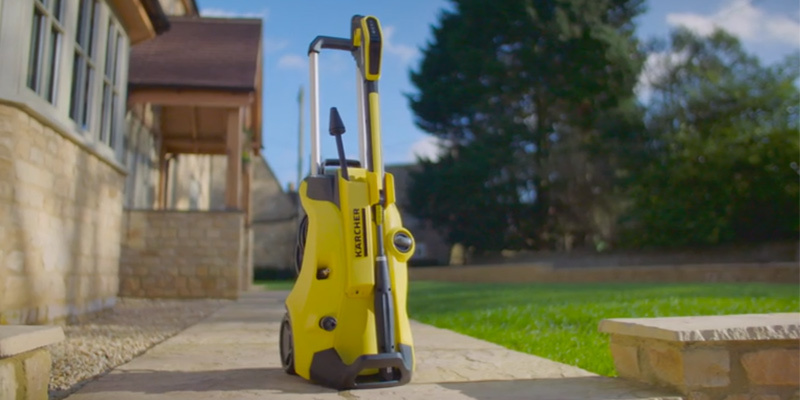 The Karcher K2 is pretty compact and lightweight, thus you can move it around easily. The included plastic connectors are rather brittle, so treat then carefully. 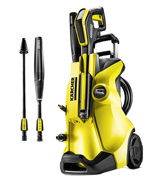 This entry level pressure washer from Karcher is ideal for occasional use. Wash your car or garden furniture and remove dirt from your patio easily with the help of the K2 that is also sold at a reasonable price. Automatic Stop/Start feature protects both pump and motor from wearing out pretty fast, while the Click&Clean Technology makes it easier to change nozzles. A bit unhandy to hold a trigger gun with a detergent bottle hooked up. The Nilfisk С110 4-5 X-Tra is a cut above the other pressure washers! Equipped with high-quality details and fitted with a number of accessories, the washer guarantees long service life and excellent cleaning results on any surface. Automatic motor shut-off option along with the pressure washer thriftiness add to the long usable life of the device. A high-pressure hose could be longer. If you are looking for a high-performance but cost-effective appliance, the Makita HW101 will meet your requirements ! Buying it, you will save money on car wash services as well as reduce time on cleaning. 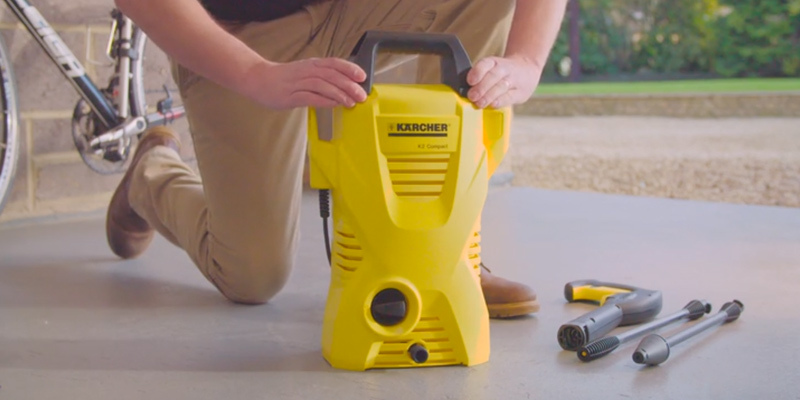 The K4 Full Control electric pressure washer is the updated version of the latest Karcher's K4 model but with new features and a pretty interesting futuristic design in the yellow housing. The pressure washer comes fully assembled so you can start using it right out of the box. As for the included accessories, the set includes a trigger gun, Vario Power and Dirtblaster lances. The full control trigger gun is compatible with all pressure washer accessories from Karcher; if you have some, you can use them fearlessly. As regards the lances, each one is meant for different cleaning purposes. It is recommended to use the Vario Power for everyday cleaning tasks, washing your car, tools and other equipment. If you need to do some heavy cleaning, the Dirtblaster lance provides 50% more pressure and removes extremely stubborn stains from solid surfaces such as a fence, pavement or sidewalks. Don't try using it for soft material cleaning and car washing, as the power jet is so powerful that it can damage lacquered surfaces easily. 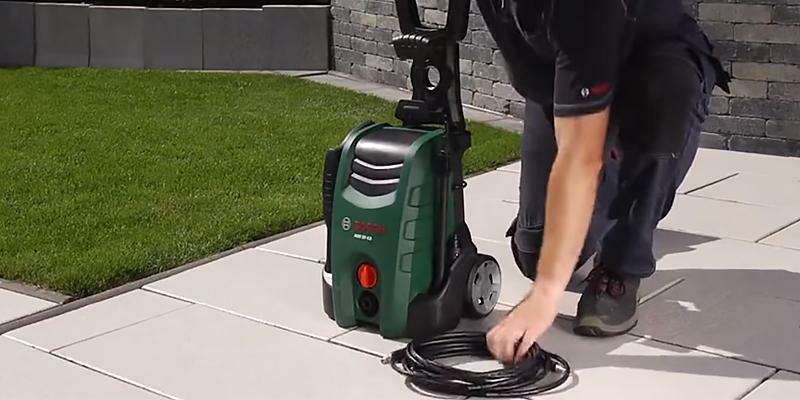 The pressure washer comes with a 6-m high-pressure hose designed with quick-connectors on either side so that you can attach the hose from any end you wish. 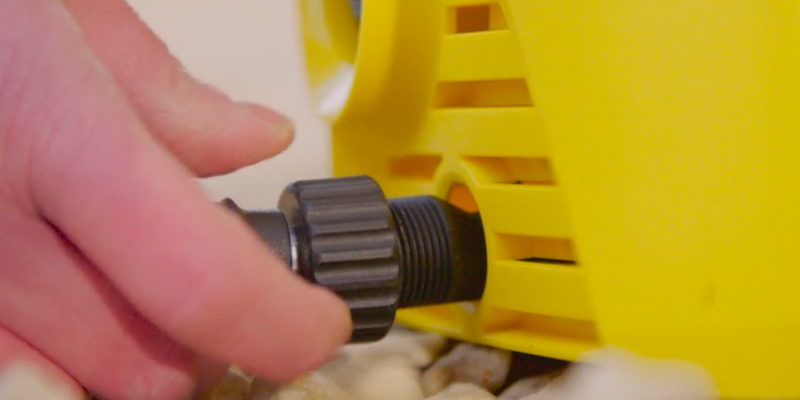 Additionally, it features a fine mesh filter and an A3/4 adapter if you want to connect a garden hose to the pressure washer. All in all, this model will help you reduce time on cleaning and provide quick and efficient results. Designed with an ergonomic handle and the Plug ’n’ Clean Detergent system this washer is meant for fatigue-free cleaning and replacing detergent with one sweep. 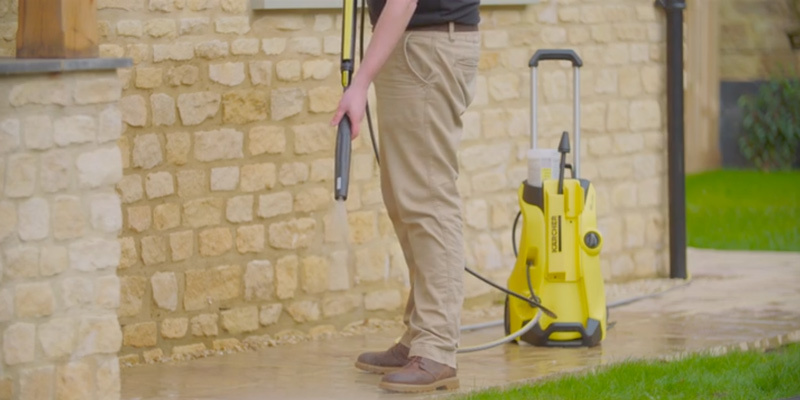 Undoubtedly, the K4 Full Control pressure washer is the best model on our shortlist. With an 1800 Watts motor onboard this appliance produces pressurised water jet of about 130 bar at 420 l/h. Thus, this high-productive model in conjunction with the included accessories will help you achieve the best cleaning results. What's also important, the K4 is equipped with the powerful water-cooled induction motor that is much more durable in comparison with those air-cooled models. The motor is protected from overheating and thus, ensures long-term operation. 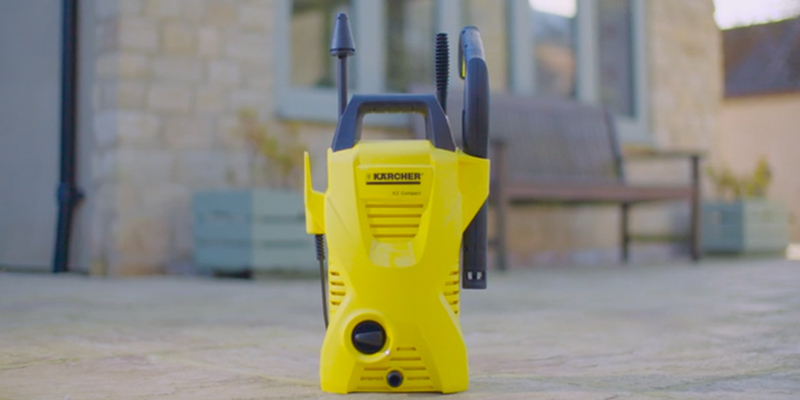 So, if you are looking for reliable equipment that will never fail you, you should definitely opt for the Karcher K4 Full Control pressure washer. 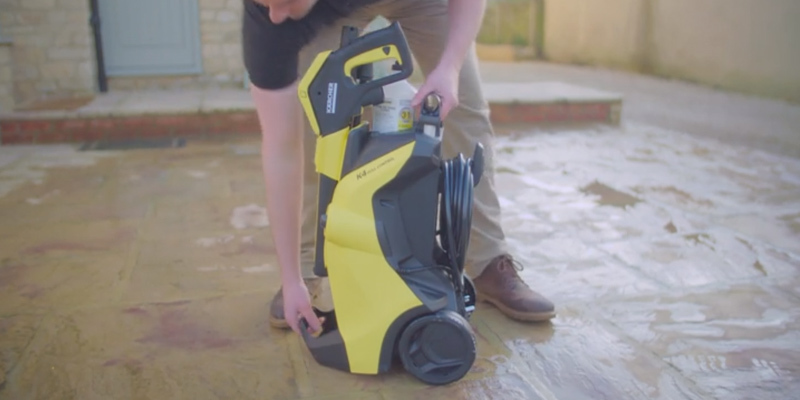 What this pressure washer offers their owners is the best settings for every kind of cleaning. The given model comes fitted with an outstanding full control trigger gun that features a LED screen! Just imagine, you can set the desired pressure in accordance with the surfaces or texture you are cleaning by twisting the lance and see these settings on the screen. It means that you will never choose the wrong setting and will not spoil a surface accidentally. What you will experience is the ideal cleanliness. Finally, the pressure washer is designed with special holders for lances and a trigger gun and a cable hook for convenient storage of the device. 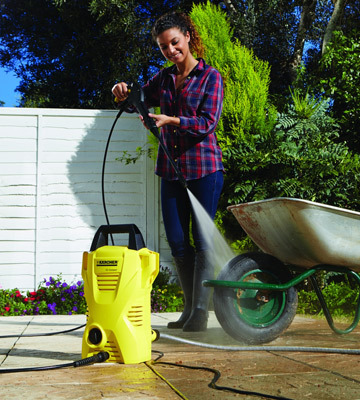 The K4 Full Control is the best selling pressure washer for residential use. You can use it for cleaning wooden fences, patios, and concrete as well as delicate lacquered surfaces. All in all, not only is this pressure washer high-performance but it will also become an irreplaceable appliance in your household for performing both light and heavy cleaning jobs. Any Bosch tool means quality, reliability, and high technology. This is another well-known German brand among the top ten manufacturers of power and electronic equipment. So, the Bosch AQT 37-13 is justly presented in our review of the best pressure washers! It is meant to turn washing into enjoyment. And, this enjoyment begins right from the preparation for work. You'll need just a minute to get your washer ready as its components have quick-connect fittings for instant mounting. Easy controls and light weight of Bosch will also please you. The body is made of robust plastic and fitted with wheels for easy manoeuvring. The washer's weight is just 6.53 kg, you'll barely strain your hands while carrying the unit. The fold-down handle allows you to save some ample space while storing the washer. Besides, the handle has special holders to reel a water hose in there. There are also holders on each side to store other washing accessories including a gun, a lance, and a power cord. The washer's front panel features fittings for hose and water filter attachment. The other side of the hose should be connected to a water pipeline or a separate water container. Keep in mind that a water pipeline provides a higher water pressure and allows a more efficient washing. The “Click and Go” system guarantees fast and secure nozzles attachment. The washer works only when you push the sprayer trigger, so don't worry about idle running and electricity wasting. In a word, the Bosch AQT 37-13 is unbelievably simple and handy washer for multiple washing tasks. The Bosch AQT 37-13 is truly easy-to-use, and now we would like to say a few words about the tasks this washer can perform. In terms of performance, this washer is perfect for medium washing jobs. The 1,700 W electric motor drives the pump that yields 130 bar of the water pressure. The water consumption is 370 l/h. This ratio is quite nice for this type of models and allows the washer to successfully deal with the washing tasks. Thus, washing your car is going to be a cakewalk. 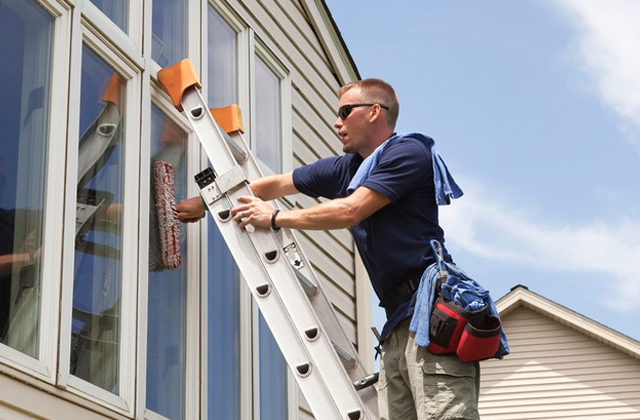 Cleaning windows, fence or walkways is a snap too. Multiple nozzles will let you wash all kinds of surfaces and objects. The 3-in-1 nozzle allows you to adjust a water jet size depending on the surface you need to wash. The 90° nozzle will be excellent for cleaning hard-to-get places, for example, the wheel well. Need to clean your terrace? The deluxe patio will help you do that! So, this pressure washer is a wonderful piece of reliability, easy operation, and cutting-edge technology. No Water Supply, No Problem! We'd like to point out the fact that you can use this pressure washer even if you stay far away from water supply and sewage. If you have got a barrel or some other container, you can take in water from them. Of course, the pressurised water jet won't be as powerful as you'd like though it would suffice for a car wash.
Nowadays everyone has a number of tools and equipment that helps us in keeping our house clean in-and-out. Same deal with a garden! 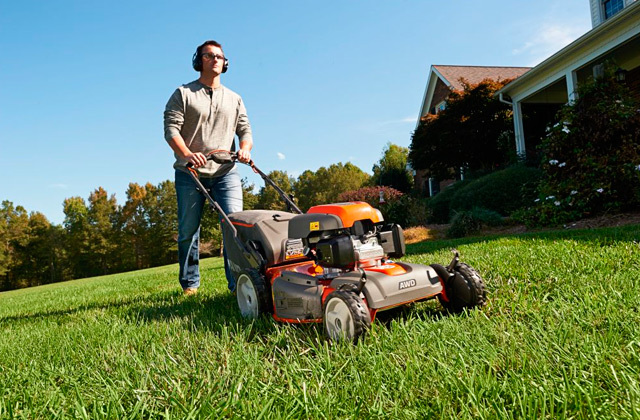 As autumn sets in every house owner become concerned about those leaves that carpet a lawn. 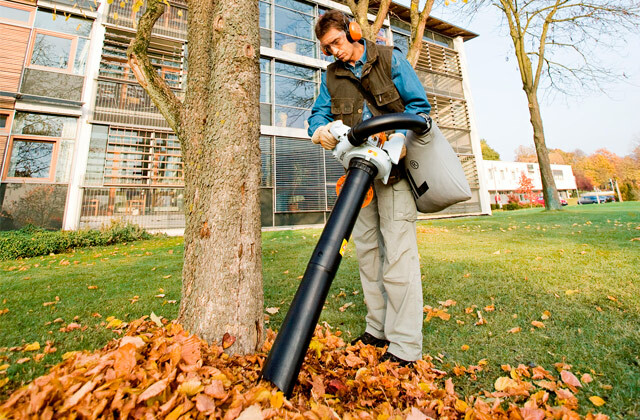 Having purchased a leaf vacuum you'll forget about brooms and rakes and will keep your yard neat easily. For a lot of people, it can be quite a challenging task to keep things clean when using a regular hose or mop. 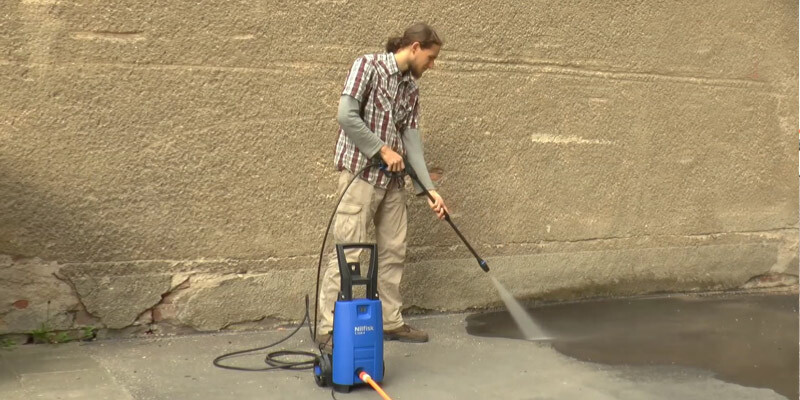 Therefore, we highly recommend you to rely on the Kärcher K2 Compact pressure washer to do all the hard work. This entry level model has enough power to tackle light cleaning tasks like washing a car, cleaning furniture, patio, and garden equipment. Powered by 1400 Watts air-cooled motor the washer delivers 110 bar pressure output with a water flow of 360 l/h. As you may see, not only is this appliance pretty powerful but it is also a very good investment that may help save you more money in the future, eliminating the need for car wash at service stations. 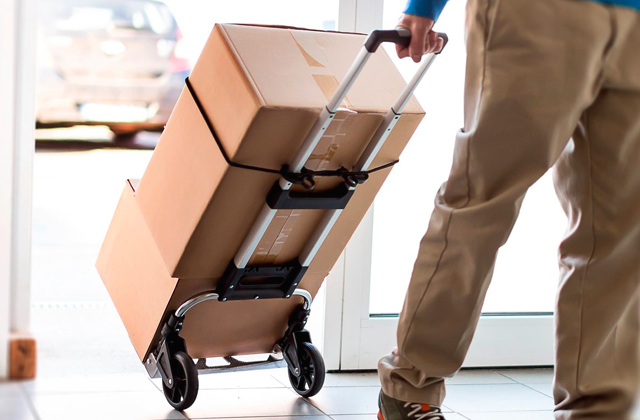 The Kärcher K2 doesn't have wheels, yet it is so lightweight that carrying it around won't be an issue at all. With the Kärcher K2, you will not need to drag around long hoses anymore. It is very easy to use and it is super efficient when cleaning. The pressure washer comes with a small number of accessories included. You will find here a trigger gun and two spray lances - One Way and Dirtblaster, which should suffice for most of your cleaning needs. But if you want to increase the pressure washer efficiency, you can always purchase additional accessories like a patio cleaner and other useful add-ons. Let's take a closer look at the included lances. 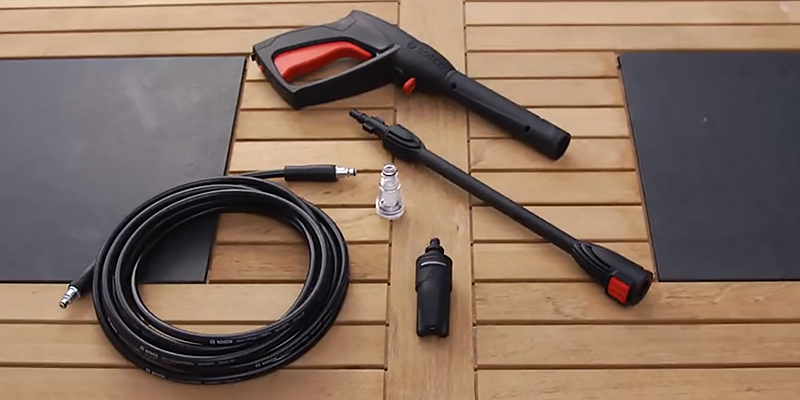 The One Way spray lance connected to the trigger gun produces a powerful water jet ideal for cleaning cars, patios, and outdoor furniture. As for the Dirt Blaster, it provides up to 50% more power than the One Way spraying nozzle. 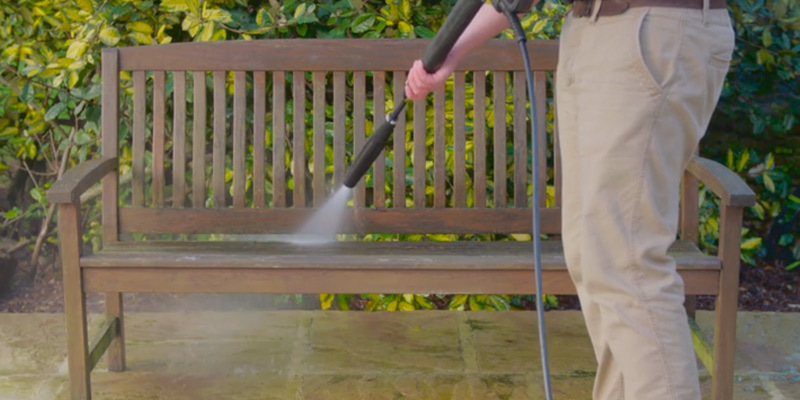 Once you hook up the Dirt Blaster, you can rotate the wand to the "Max" or "Min" positions, depending on your cleaning needs, and wash away all kinds of grime and dirt from your pathway in a breeze. 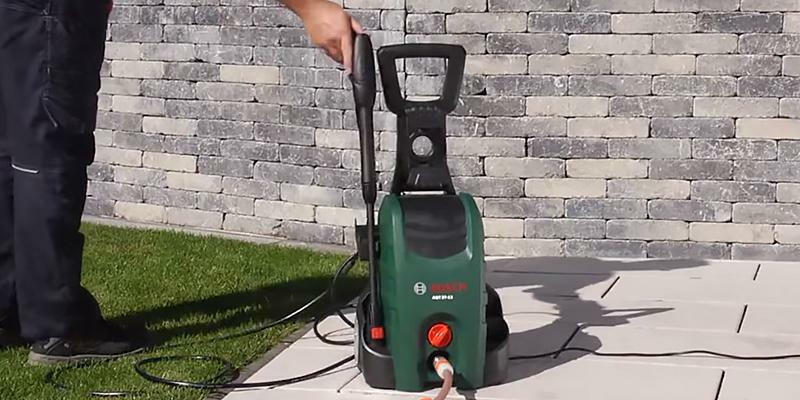 Additionally, the Kärcher K2 Compact comes fitted with a 4-m long high-pressure hose and a 5-m long power cord, making the pressure washer pretty manoeuvrable and easy-to-use. We'd like to note that the pressure washer features an inlet fine mesh water filter. 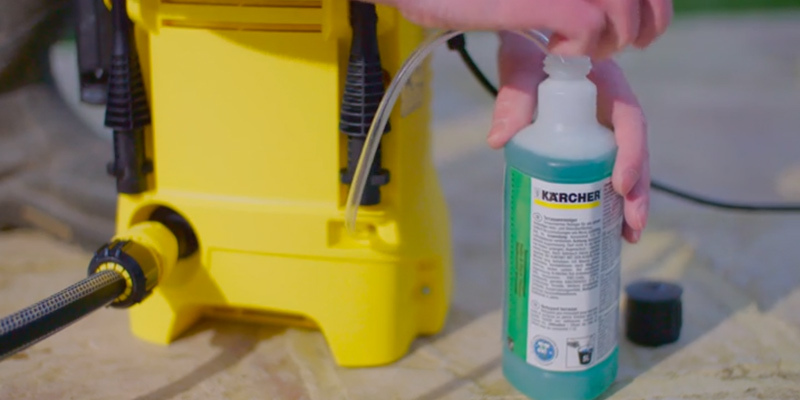 Thus, if you connect a garden hose to the K2, the filter will prevent debris entering and will protect the pump and motor from damage. Finally, the filter doesn't require sophisticated maintenance; it is washable, so you can clean it whenever you need prolonging the pressure washer service life at that. We also like the fact that the pressure washer is designed with a detergent suction tube that draws cleaning solution from any outer container. Thus, you can boost the pressure washer cleaning power to remove even obstinate stains from any surfaces easily and clean the windows and car body more efficiently. 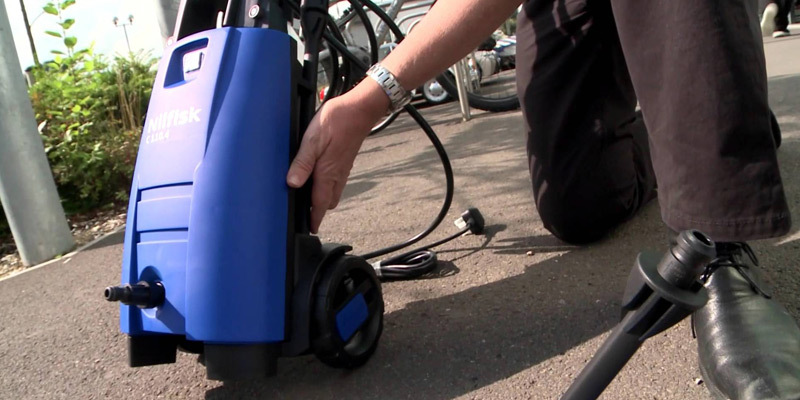 The Nilfisk C110 4-5 X-Tra pressure washer offers the best price-performance ratio. 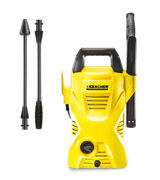 This model is the great option away from the Karcher goods as it is the next best pressure washer you will ever find. 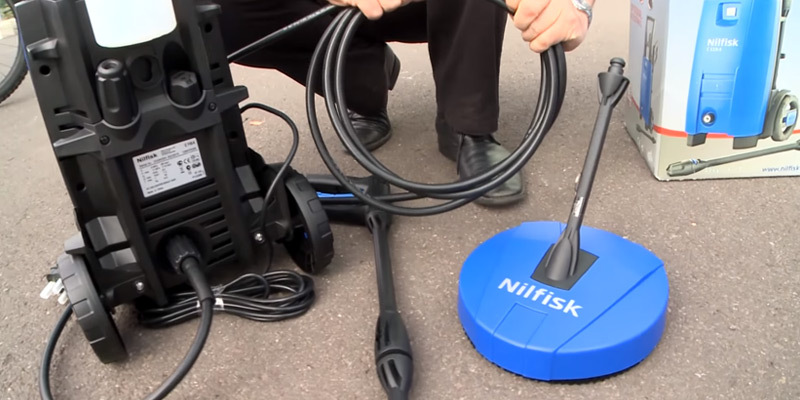 Equipped with a 1.4 kW electric motor the Nilfisk C110 4-5 is capable of producing a pressurised water jet with ratings of 110 bar and 440 l/h. With such operating pressure yield, no scrubbing or soaking is required to clean your bicycle, car body, patio or sidewalks. All you need to do is press a lever on the trigger gun handle and direct water jet at a dirty spot; seconds later you see dirt disappear. 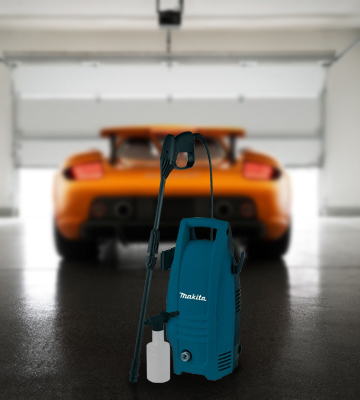 The Nilfisk C110 4-5 X-Tra has a brushless motor that boasts excellent water-resistant properties and durable operation and a pump for increased washer capacity. 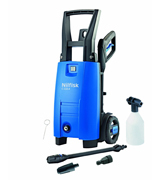 The Nilfisk pressure washer has a standard set of nozzles and lances included in a package. On changing them you will get a different width of spray to wash off grime and mud from various surfaces. But what's important is that the manufacturer has implemented the Click & Clean technology here for a quick and easy change between the accessories. So, click the nozzle on a lance to start the operation or press the quick release button to remove it. Excellent! So, let's take a closer look at the accessories. 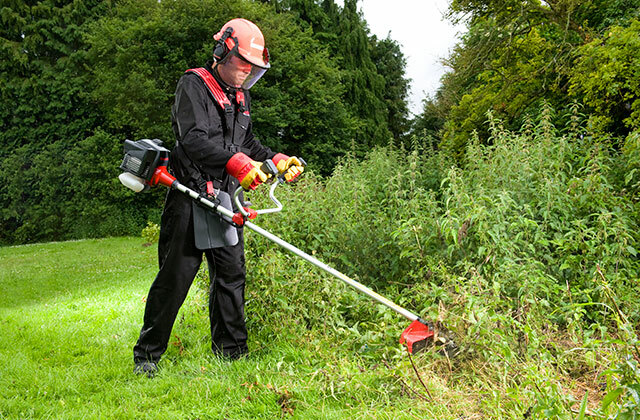 The set includes a trigger gun with an ergonomic handle, a 5-m long high-pressure hose, a Powerspeed nozzle, and a Vario nozzle. The Vario nozzle is ideal for everyday cleaning needs as it allows you to adjust the water jet pressure according to the surface you are about to clean and thus, use it on delicate surfaces fearlessly. As for the Powerspeed sprayer, it produces a rotating water jet that is 2 times as powerful as the jet produced by the Vario nozzle. This accessory will come in handy when cleaning ground-in dirt from solid surfaces. The kit also includes a spray bottle for convenient use of spray detergents. When being attached to the nozzle and triggered, it starts to form a lather with which you can cover quite big surfaces to clean them faster and better. All in all, this washer will help you get everything off with ease. A fantastic pressure washer for the price. Pressure washing is the most efficient and quick method of grime and dirt removal. However, it isn't recommended for indoor use. Should you need an effective appliance for cleaning your house, we'd recommend you to consider buying a steam cleaner which not only helps remove dust, dirt, and grime but is also known as an effective sanitising solution. Steam cleaners don't use any chemicals and are totally suitable for allergic and asthmatic people. The last but not the least feature to mention is onboard accessory storage. The pressure washer is designed with a special trigger gun holder and a high-pressure hose storage hook. 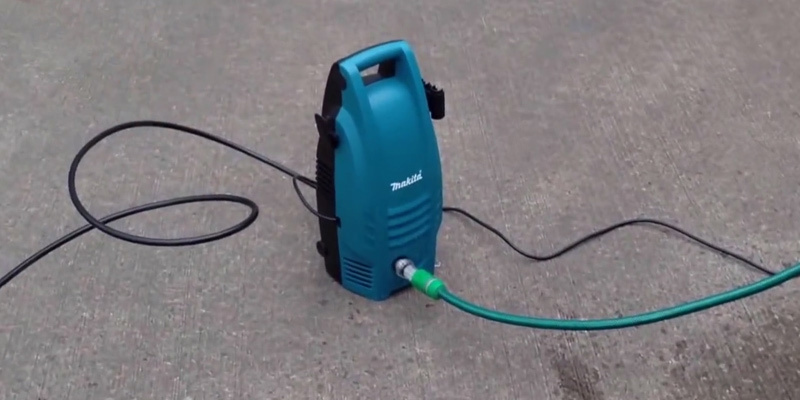 Instead of searching a place where to store the hose away, you can wind it around the pressure washer itself. There are several additional inlets on the housing, which you can use to store nozzles, a detergent bottle, and a foam applicator. Such a handy design makes it easy to keep all accessories in place. 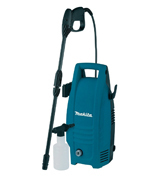 The Makita HW101 is designed for cleaning small areas and different types of surfaces. It is effective on plastic, metal, and concrete and hence suitable for a variety of cleaning tasks. Thus, we can safely recommend it to everyone who is searching a low-cost but effective solution. The Makita HW101 comes fitted with a lance and a detergent bottle, and even though this number of accessories may seem rather scarce, you will hardly need more add-ons. The lance is adjustable, allowing you to choose the optimal water jet pressure according to the surface you need to clean. The Makita HW101 has proved to be efficient in removal of even obstinate stains from solid surfaces such as driveways, garden paths, fences or house walls. It is also good for washing cars and delicate surfaces. Those who think cleaning a car or other garden equipment with a sponge and a garden hose is easy, have never tried doing it with a pressure washer. 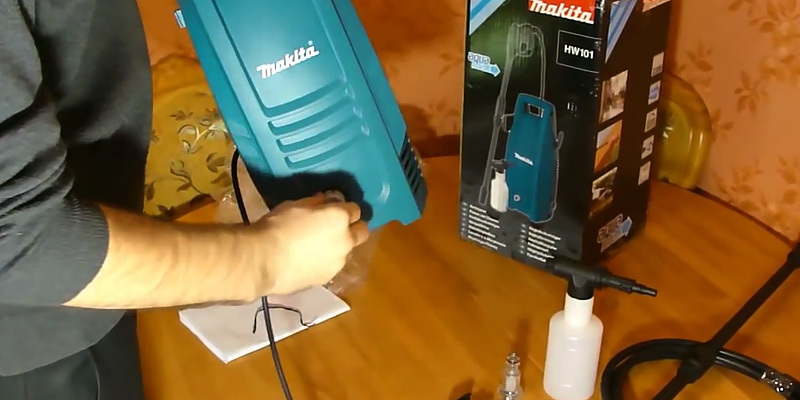 The Makita HW101 can become your real time saver, reducing the cleaning time almost by half. It is equipped with a 1300 W motor that produces water jet up to 110 bar at360 l/h and maintains this level of pressure throughout the whole cleaning process. Made of high-quality plastic the housing of the pressure washer is fully protected from water ingress. 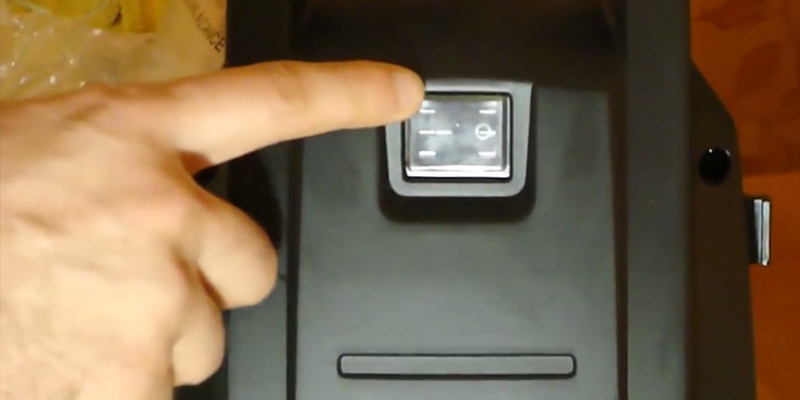 For added safety, the On/Off button has a silicon cover so that you can toggle it safely even with wet hands. Additionally, the housing is designed with various removable hooks and holders for convenient storage of a trigger gun and a lance. The ergonomic trigger gun is made of smooth plastic and features a pretty large lever and a safety lock that won't let you pull the trigger accidentally and will protect you from potential injuries. Finally, the pressure washer weighs only 7.3 kg, thus you can move it around your yard easily and transport or store in a garage. For sure, the given model is the best option for residential use. The pressure washer by Makita can remove any ground-in dirt and will easily wash pathways and driveways. But what about a variety of tasks that require not only dry but also wet dirt and liquids removal? For these purposes, a wet-dry vacuum cleaner will come in handy. 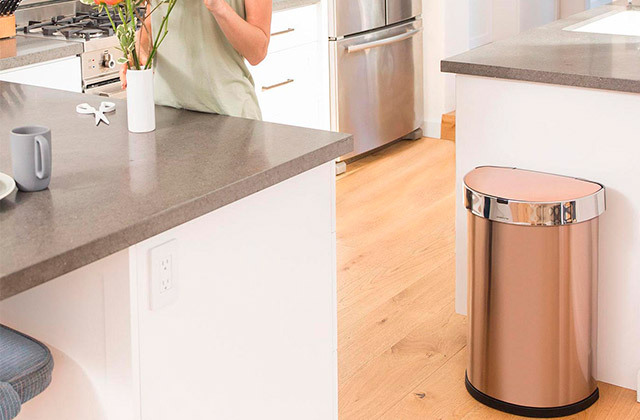 This appliance is very helpful in removing construction debris as well as cleaning the area around your house. 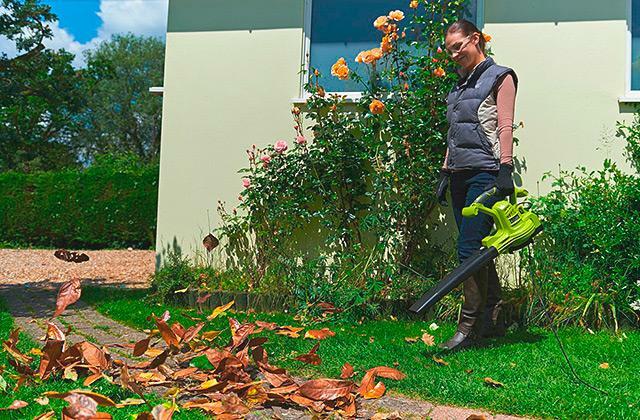 Some of these cleaners have the functionality of leaf blowers and can be used for removing dry leaves, small twigs, and debris scattered in your yard. 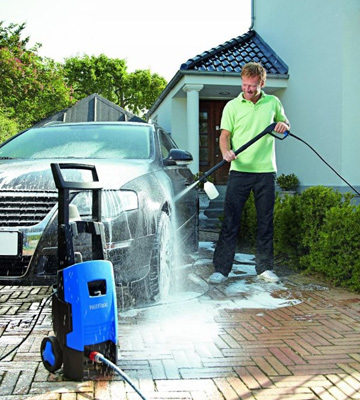 In this review, we compare the best pressure washers for use in detached houses and garages. It’s the most effective tool to fight against dirt, grime, mud, old paint, and dust. A powerful water flow under high pressure and at a high velocity can quickly remove all types of pollution and ensure excellent cleaning results in the shortest terms. A pump of a pressure washer is geared by the power of electric engine so a water flow can be regulated for higher efficiency in a custom way. 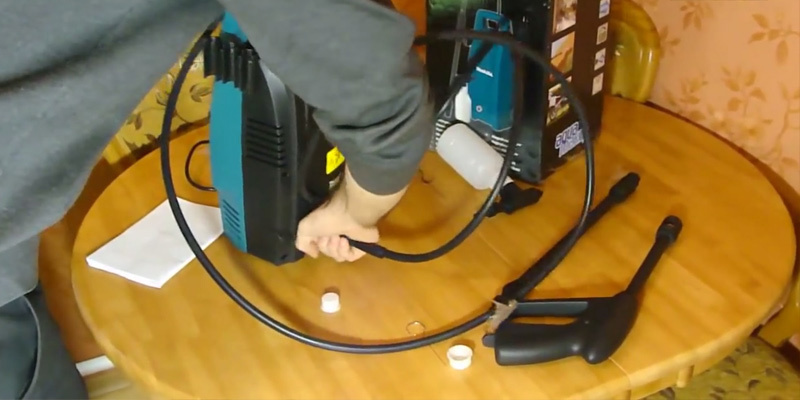 The pump is connected to a hose and a spray gun. You can use a pressure washer to clean your car body but how to keep the interior of your car clean? Consider getting one of car vacuum cleaners. Your garden and lawn also need to be clean! That's why we suggest paying attention to our leaf blowers review. 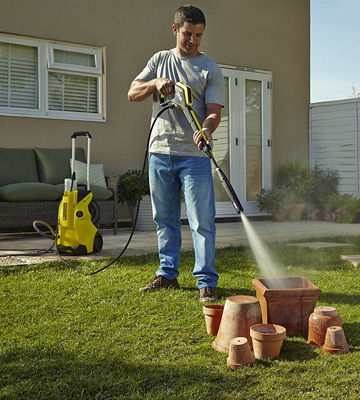 Have you got a pressure washer at home? If not, then you know firsthand how difficult it may be to remove the dirt, grime and old paint from decks, patios, and siding. For owners of detached houses, big-box stores, and garages, having a washer pressure is definitely a must. There’s hardly any more effective tool available on the market with the same cleaning power. A Water Pressure discharged from a unit quickly blasts away the heaviest contamination and leaves you very little job to do - hide the cord and shut the unit off. All pressure washers are divided into those that use either electric motor or petrol engine. The petrol-powered washers are usually more powerful compared to electric machines with the generated water pressure ranged from 135 - 195 bar. Contrasted to petrol washers, electric machines put out only about 90 - 135 bar, which is considerably less, but not necessarily worse. What you need to understand is that the more pressure you use, the more risk you run to injure delicate surfaces like wood, outdoor furniture, vehicle interior, grills and more. So, maybe it is not such a bad idea to purchase a less powerful pressure washer for small and middle-scale jobs and ensure that your surfaces are cleaned off with care. We guess, it all depends on a purpose you pursue. Petrol pressure washers are also bulkier in size and more complicated in terms of upkeep and control. Unlike electric pressure washers that quickly start up on a single trigger, petrol models require fuel-mixing, accurate tune-up and hand pull-starting. They are also much noisier than electric machines and hence, require some hearing protection. With all that said, it’s not surprising why such a big number of customers prefer to buy electric pressure washers. They are slower, it’s true, but at the same time they require less caution in use, produce less noise and work accurately on most surfaces. 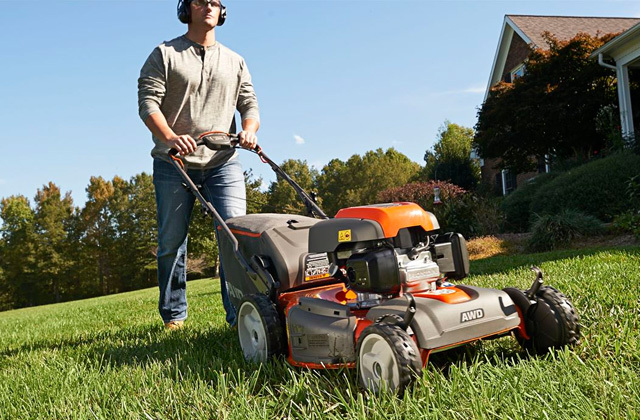 The only inconvenience that you may find about an electric-powered machine is the need to drag a cord around, however, once it’s long enough, it’s hardly going to spoil your experience. Both, petrol and electric pressure washers come paired with some additional nozzles - adjustable and replaceable, that directly affect the cleaning results and overall Usability of a washer. Adjustable nozzles are much easier in use. With a twist of a hand, you can change the width of a spray and quicker get rid of pollution. Replaceable nozzles allow changing the angle of a spray and get to hard-to-reach areas. 1. 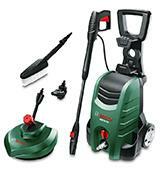 Pressure washers Argos Buying Guide, Argos. 2. Victoria Pearson Cleaning your car with a pressure washer, Which? 3. 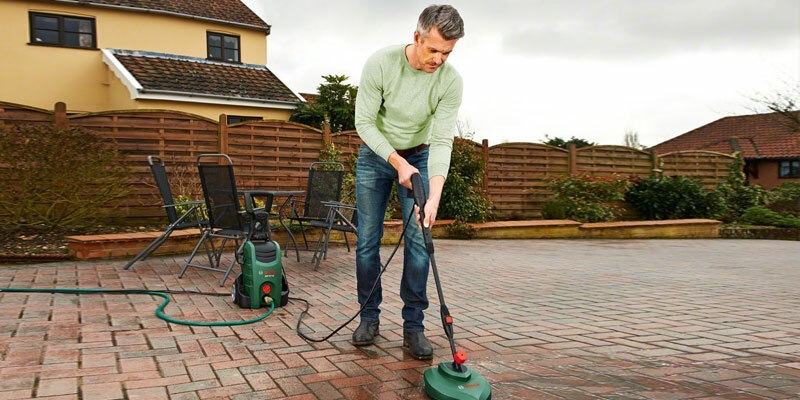 Pressure washer buying guide, Homebase. 4. The Do's and Don'ts of Buying Pressure Washers, eBay. February 23, 2016. 5. Roy Berendsohn Everything You Need to Know About Pressure Washers, PopularMechanics. August 19, 2013. 6. Pressure Washer Buying Guide, Lowe's. 7. Chris Woodford How does a pressure washer work? ExplainThatStuff. February 28, 2016. 9. 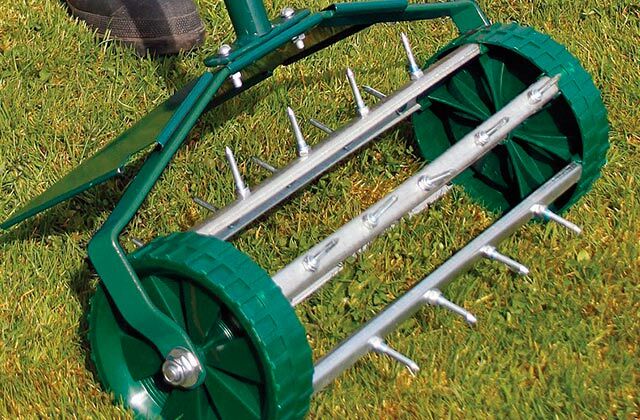 Pressure Washers Buyer's Guide, Northern Tool + Equipment. 10. The Best Pressure Washers: Reviews & Tips for Buying, The Family Handyman.